In the late seventies and early eighties, Carole and her family lived in a house in Key West in Florida. She would see Cuban asylum seekers floating to shore on rafts they had strapped together out of inner tubes and driftwood. She was greatly affected. Since 1966, seven years after the Cuban revolution put Fidel Castro in power and in the context of the Cold War, the US had viewed Cubans as political refugees eligible for US citizenship if they could just make it to the country. However, because of travel restrictions and limited resources, those desperate to leave the country scavenged raft materials and inner tubes to become balseros, attempting to float across the Caribbean waters to the Keys. When balseros made it to Florida they were destroyed by the journey: dehydrated, sun-sick, hypothermic, starving. However, they also become an integral part of the Florida and US community: in total more than a million would eventually call the state home. Seeing these refugees, Carole was moved to produce Innertube Variant II, the torso and arms of a woman resting her head on an innertube. It has been made and re-made since the 1980s in many forms, coming to be known as Survival of Serena. Yesterday a senior fabricator, Natasha Rodriguez, started teaching me how to do the lay-up of one of Carole’s sculptures, a Mini Serena. Serena is resting on an inner tube, her head on her arm. She looks tired and self-satisfied. Talking with one of the artists here, Heath Wang, he said he saw in it the story of a woman who has escaped abuse and created a new life for herself, and is resting in that moment of security she has created… I'm attracted to Serena's floating, mobile self-security. Learning more about the history of Survival of Serena in the time since, I’ve come to appreciate it as one of Carole’s most important works. This sculpture can be more specifically discussed in a political context as an immigrant narrative and a refugee problem. The floating figure is a direct reference to the experience of crossing the water that Carole watched the balseros take again and again. That self-security is something Survival of Serenahas won on the back of her journey as an immigrant, and that is part of why the sculpture has remained one of Carole’s most popular pieces. It has a resonance through different refugee crises that the US and the world have encountered since. Those who view Survival of Serena can connect it to the Cuban balseros, but it can also be linked to the Honduran, Guatemalan, and Salvadoran families that have been escaping Central American violence since the 1990s. 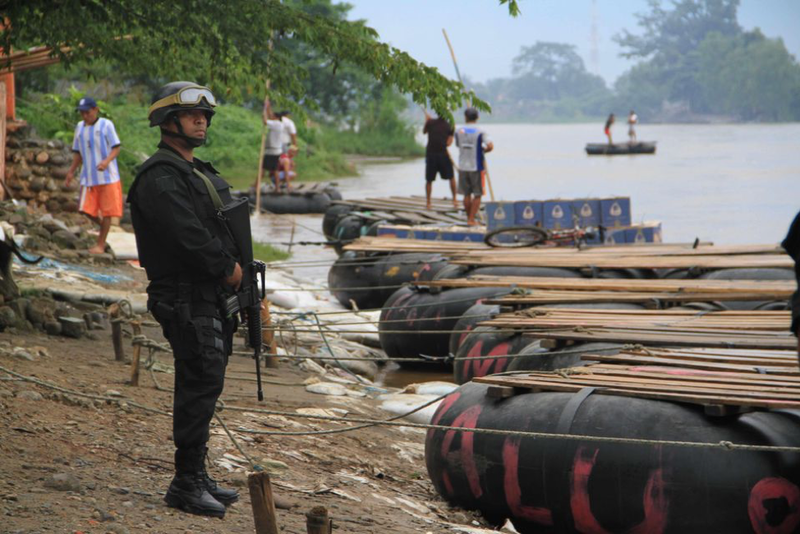 A Mexican border patrol agent looks out at the river at the border with Guatemala. Photo by N. Parish Flannery @LatAmLENS. That violence has roots in the United States. Many Central American criminal organizations can be traced back to Los Angeles, the weapons they use to control and terrorize are primarily a US export, and the market that they sell narcotics to is the US. Many of the migrants who flee this violence are children and women who choose not to cooperate with these gangs and are faced with death. They have an aspiration to become Survival of Serena, to have built their own self security. Unfortunately, the Trump administration is actively seeking to destroy that possibility for migrants from Central America and from around the world. The public debate on migration in this country is centered on the intense coverage of family separations occurring this summer on the US-Mexico border. It’s reported that more than 2000 children have been separated from their parents while those parents are being detained and tried criminally for illegal entry into the country, even if they have a legitimate claim to asylum. Meanwhile, Attorney General Jeff Sessions has released recommendations for strict limitations on what an asylum claim looks like, by rejecting the threat of gang or domestic violence as valid grounds for a claim. Additionally, Trump has successfully pursued a ban on travel and immigration of those from five Muslim-majority countries (along with North Korea and officials of the Venezuelan government), a ban which was recently upheld by the Supreme Court in Trump v. Hawaii. Two of the countries, Syria and Yemen, are currently undergoing civil wars that the US fights in and supports, creating a massive refugee crisis that the Middle East and Europe have largely borne the weight of. However, those Yemenis and Syrians who have family in the US and even with US citizen children are now unable to come to the US by any means, continuing the administration’s policy of family separation. Donald Trump and Jeff Sessions aspire to destroy the meaning and hope of Survival of Serena’s meaning and to destroy that aspiration to a safe and peaceful life for those who are threatened by violence that is often a US export in the first place. Ultimately I just want to say this: more than half of the people who work in Carole’s studio right now were born outside the US, myself included. Carole herself is born of immigrant grandparents escaping Hitler, and being allowed to have asylum in the USA. Our lives have been profoundly affected by the vagaries of policy around migration and immigration in this country and abroad. Making sculptures themselves is not an effective way to fight immoral policy, but producing symbols that have cultural resonance is tool that can be used to suggest moral, aspirational alternatives if the conversation around those symbols happens. Carole says that Survival of Serena is a universal sculpture. She points to the fact that even for those who weren’t born outside of the US, migration have been a part of most families’ experience. There have been so many different migrations: those who are refugees from war or famine or flood, those who survived the Trail of Tears and colonial terror, those who were enslaved, those who fled north during the Great Migration, those who moved to the suburbs, those who came to cities because rural economies were corporatized, those who escape their families, those who send money back to their families because there are no jobs at home. I don’t know if Survival of Serena can speak to all of these histories, and exist in dialogue with them, then her mobile self-security is probably the best that all of us who are at the mercy of history can hope for.